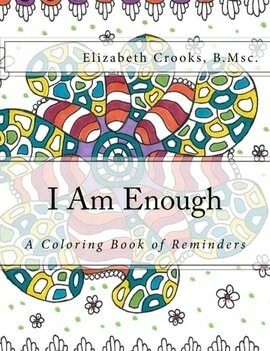 This coloring book is for those who write “I am Enough” on their bathroom mirrors, and this coloring book is for those who want to start remembering that they are more than enough every day. Words have power. Words form our perceptions and create our realities. When you change the words you use, your life changes as well. Words are important and, when used purposefully, they convey messages to instill constructive mindsets. Now is the time to move beyond believing that you are not worthy enough, not loveable enough, not beautiful enough and not intelligent enough. You are more than enough. We all are. It takes 10 to 30 days to wire in a new habit. If you don’t already believe that you are enough in all aspects of your life, start with these simple phrases and repeat them every day for at least 10 days, and ideally for 30 days. The human mind believes what it sees, what it hears, and what it experiences most often. Make feeling more than enough familiar by training yourself to believe it. Post your colored reminders around your home. Surround yourself with positive images and positive words and remind yourself each and every day, at least three times a day, until you no longer need a reminder. Use this coloring book as just another tool on your journey of self-discovery. Use these affirmations of being enough to elevate your self-worth until you know, wholeheartedly, that you are more than enough in everything that you do and everything that you are. Choose to color and post the reminders that you resonate with, or are drawn to, first. Often these are the ones we need the most in our lives right now. There are 30 unique, one-sided reminders to color. The reminders included are: I am beautiful enough, loved enough, successful enough, smart enough, strong enough, good enough, and many more. We are all more than enough in all aspects of our lives, and when we start to remember this our lives improve on many levels. Change the words you use to describe yourself for the better. Use coloring to your advantage by committing to forming a new, uplifting habit while having fun, getting creative, and relaxing to your one of your favorite pastimes. ​So, why does “I am enough” work? How does this affect me? And why should I commit to telling myself that I am enough? ﻿Once you buy into not being enough as a child, you can believe that your entire life. Not believing that you are enough is often behind every issue we have as human beings. You came into this world as enough. You came into this world as a perfect baby who is meant to be here. “I am enough” is a powerful phrase for its simplicity. It is so simple that the mind cannot reject it as anything but true. Logically it is true. There is no objection to “I am enough,” whereas saying “I am a Goddess” or “I am a rock star” is a lot harder for the mind to believe if you have never thought you were good enough before. “I am enough” is a simple affirmation that contradicts almost every issue known to the human mind. Many people don’t feel as if they are enough, whether that is smart enough, loveable enough, worthy enough, deserving enough, beautiful enough, able enough and so on. This simple statement reverses all thoughts and beliefs of not being enough, once you believe it that is. And it takes time to believe something new. It takes practice. It isn’t easy, and it doesn’t have to be hard, but it is simple. Just keep at it and re-train your own brain to believe that you are enough by seeing it, hearing it, and practicing it every day until you know it to be true. Changing one belief about yourself: that you are enough and always have been and always will be enough, will change your life. When you achieve something, say “I deserve this, because I am enough.” When someone tells you they love you, say “I deserve this love, because I am enough.” When someone tells you they like your hair or your outfit, say “I deserve compliments, because I am enough.” You are more than enough in all aspects of your life. It is up to you to start believing it. Put in the work, for a relatively short amount of time, and just give it a try. If it doesn’t change your life in a month, then no harm done; you can go back to how things were before.